These days, you hear a lot about high profile data breaches, phishing attacks and password leaks, leaving thousands of accounts vulnerable to hackers. That’s not to mention what doesn’t make the news; the everyday hacking of personal and business accounts. All of this leaves us concerned about the online safety of our data, personal and businesses information. 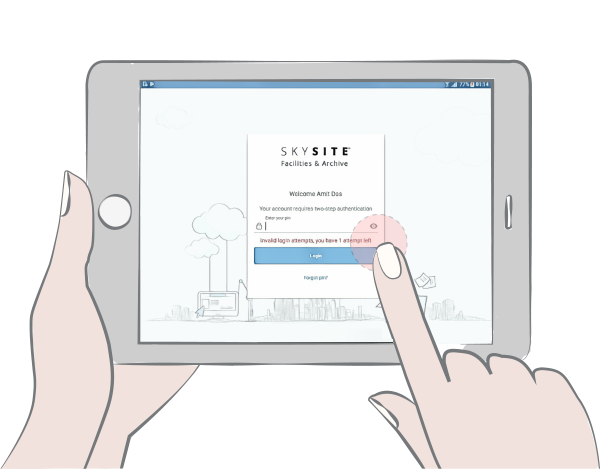 With two-step verification, you can take control and provide an extra layer of security for your SKYSITE account. Opting for two-step verification is as simple as ticking a box. Safeguarding access to your accounts is a priority and when you choose two-step verification, you have the peace of mind that all users on your account will be required to activate enhanced security. Provide advanced and upgraded security. Second security layer to reconfirm your identity. Set password expiration date: 10 days, 30 day, 90 day, your choice. Enforce all users on the account to set-up a complex password plus two-step verification. Select your security questions and PIN. Don’t be a statistic. Get peace of mind with two-step verification. Get SKYSITE today!